I love telling my son about the belly button connection, too. Some writer (I forget which) said the breast<-->child's mouth is the second umbilical cord between mom and child. I've always liked that imagery, too. Hope your son feels better soon. Seems the whole world is getting sick right now!!! Oh, I love that imagery! That's perfect. Absolutely beautiful! I'm all for mushy stuff and this sounds like a great thought to remind us on rough days! Now I want a book about belly buttons! I know I've seen some cute ones for kids, but I've never read one. I want to know what is in them now. what a sweet post! i had to share it on facebook..
what a neat post. I have never thought of my bellybutton this way. Hope little M feels better soon. No fun for anyone. We have the sniffly-baby thing going on here, too. Not fun, not fun at all. But now I can look at my wee one's bellybutton, and feel a bit better. Thanks for a nice thought on a grey, not-so-great day. Aw, I'm glad you all liked it! Thanks for sharing it on Facebook, Missy. Are we FB friends yet? I'm still figuring it all out. Lauren Wayne there if anyone wants to friend me! 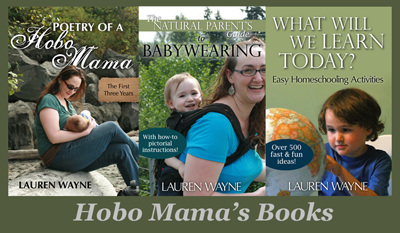 :) Plus, I have a Hobo Mama page. Mikko is all better, or as well as can be during sniffly season!